Last night the Grand Tour Jazz Fest 09 got started at the Parco delle Fonte in San Gemini with the Iiro Rantala New Trio. The weather was cold, damp and threatening so at the last minute the Vanni brothers wisely moved the concert indoors to the auditorium adjacent to the park. While the auditorium lacks the magic of the park, on this night the magic was in the music. Wine critics who write of hints of mint or suggestions of walnut, raspberries, anything, that is, except grapes, have always amused me, but at the risk of sounding just as silly, I’ll try to suggest the flavor of this very original Finnish trio, made up of Iiro Rantala on piano, Marzi Nyman on electric guitar, and Felix Zenger on beatbox. The beatbox, which amplifies and distorts sounds made orally by the performer, substitutes for a bass, drums and percussion, and adds some original zoo-like sounds. Given my age, I prefer the traditional instruments, but this kid is a phenomenon, both entertaining to see and hear, and effective in contributing to the musical concept. Marzi Nyman seems to be a hairless Frank Zappa. He sang in a couple of numbers, his voice as wildly distorted as his electronically modified guitar playing. While Zappa is his model, I detected hints of Jimi Hendrix and George Benson in his playing. 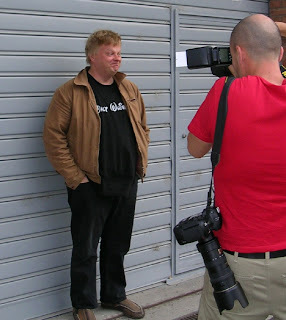 Iiro Rantala resembles Bennie Hill and projects a similar zany persona. Like the Danish performer Victor Borge before him, he subverts the sweet romantic classical playing that he’s so good at with an irrepressible tendency to veer off in comic detours. At times he leads the group into swelling passages that conjure soundtracks for really big movies, with Nyman adding symphonic effects, while at other times he does his take on boogie-woogie. Rantala described his composition A Chick from Korea as having three parts: a Finnish tango, a funk section (very electronic), followed by Norwegian art jazz, and the music perfectly followed that unlikely scenario. All told, an astonishing and entertaining concert, brilliantly performed. The audience loved it and I think the performers had just as much fun. Next up is the Omer Avital Band of the East at the Chiostro Boccarino in Amelia. There’s also a wonderful exhibit of black and white photos in Terni throughout the festival by Roberto Paolillo, the son of the famous jazz producer Arrigo Paolillo. It contains images of visiting American jazz legends, from Louis Armstrong to Ornette Coleman in the 60’s and 70’s. On Thursday Kurt Rosenwinkel will be at the Abbazia di San Pietro in Valle.